An atmospheric, chilling page turner from rising star Martin Stewart, reminiscent of Stand by Me and Netflix's hit drama, Stranger Things. Sep, Arkle, Mack, Lamb and Hadley: five friends thrown together one hot, sultry summer. When they discover an ancient stone box hidden in the forest, they decide to each make a sacrifice: something special to them, committed to the box for ever. And they make a pact: they will never return to the box at night; they'll never visit it alone; and they'll never take back their offerings. After working variously as a recycling technician, university lecturer, golf caddy and English teacher, Martin Stewart turned to his passion for storytelling and began writing novels. Born in Glasgow, where he now lives, his first novel, Riverkeep, was longlisted for the Guardian Children's Fiction Prize. 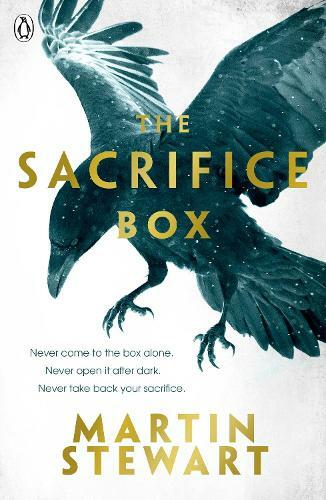 I was sent a copy of The Sacrifice Box by Martin Stewart to read and review by NetGalley. I have had this moving up my TBR pile over the last month or so, but it was immediately catapulted to the top on the advice of a fellow twitter user and I really didn't regret pushing it up the list. *I'm assuming that this quote from the book, that I liked, is accurate and that everything worked out okay in the end. Because I didn't finish reading this book.